How do I set SMART goals for my passion project? When you think of setting SMART goals, it’s easy to think they only apply to our finance, career or even health and fitness goals. They’re not something you want to set when you have, say, a passion project like a skincare blog or a photography Instagram account. After all, you’re probably thinking: passion projects don’t need goals! You just have to go out there and work on them whenever you have a spare minute. That’s why they’re called passion projects…right? Sure, working on passion projects “whenever we have the time” sounds okay and all, but here’s a secret. What are SMART goals anyway? Now What? What to do after setting SMART Goals. If you start setting SMART goals for your passion project, that project can turn into something more – a side hustle, a way to earn passive income, or even a full-scale passion-based business! You’ll be turning your passion into something that gives you meaning and purpose every day, not just into a stress-reliever for whenever you have a free minute. Pretty cool for just a passion project, huh? If you’re convinced, read on because I’ll be telling you how you can start setting SMART goals for your own passion projects. Just in case the last time you heard about setting SMART goals was way back in high school, we’ll take a quick refresher on what these goals are – or, more appropriately, what the SMART in SMART goals stands for. Originally introduced by George T. Doran in “There’s a S.M.A.R.T. Way to Write Management’s Goals and Objectives” back in 1981, SMART goal setting has become synonymous with goal setting in general. You might come across different versions of the same acronym, but no worries. At the end of the day, they all point to this one thing. The reason we’re dead serious about setting SMART goals is so we can get crystal clear on where we’re going and how we’re going to get there. You don’t win a race by not knowing where you’re supposed to go, do you? And in the same way, even our passion projects – if they’re going to become more than just hobbies one day – deserve some goals backing them up. We need those guiding stars for our personal projects just as much as an airplane pilot needs the runway lights to see where he’s landing. 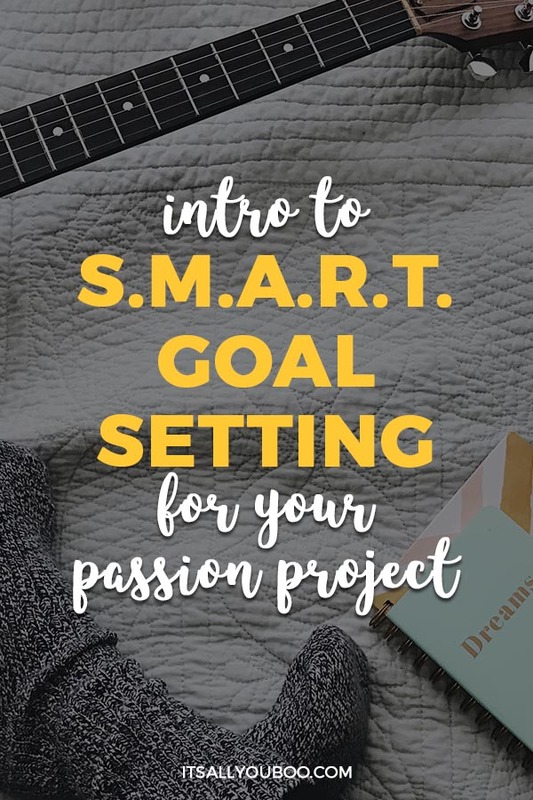 So if you aren’t doing any kind of goal setting with your personal projects right now, stick around – I’ll show you exactly how to set those passion project SMART goals so that you can be one step closer to living your passion every day. Do a quick check on Google, and you’ll find that there are SMART goal examples on just about anything you can think of (like for losing weight or for starting a business) – except passion projects. So you don’t really have much to use for reference. But no worries. 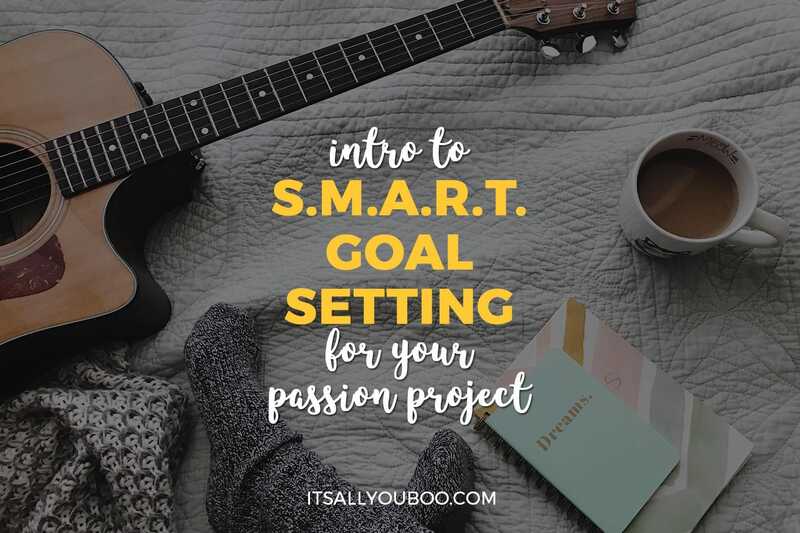 I’ll be going through each of the criteria for setting SMART goals again, this time narrowing down on some of the most common passion projects people have right now (that you might also have or are considering starting). Feel free to use the examples below as your own SMART goals template for your own passion projects! When you’re setting SMART goals, you want to be specific. That means getting crystal clear on the what of your project and your goal. Don’t worry about getting too specific; if anything, you might find that really zooming in on the what of your project helps you out more. Starting a blog: I want to start a lifestyle blog to become a resource for young 20-something women in need of make-up advice, skincare reviews, and fashion tips. Launching a YouTube channel: I want to start an educational channel for people to find home and room DIY tutorials because I know there are more affordable, alternative ways to have a gorgeous home. Creating a photography portfolio: I want to use Instagram to showcase my photos of urban city life and street fashion portraits. Starting a small business: I want to sell customized watercolor prints on Etsy. Are your goals for your passion project measurable? What’s your #1 most important number for you to know that you’re on the right track to slaying those passion project goals? Is it views? Is it followers? Make your goal as quantifiable as possible, and don’t forget to be specific! Starting a blog: I’ll set up and launch my blog and website in 2 weeks, and I will publish 1 new post once a week. Launching a YouTube channel: I’ll set up my profile in just 1 day, shoot and edit my first video in 1 week, and release 2 new videos a month. Creating a photography portfolio: I want to post 1 new photo every day, so I will have scheduled shoots 1 day a week and post-process all my new photos in 3 days. Starting a small business: I will take my first customized watercolor print order on Etsy within 2 weeks of setting up and will market myself so I can reach at least 5 orders every month. How can you make sure you actually achieve your goals? Remember that setting SMART goals also means showing up to do the work, so be sure those goals aren’t impossible. Otherwise, you won’t be motivated to get them done. Starting a blog: I will brainstorm on at least 15 possible topics to add to my editorial calendar before sharing my blog. Then, I’ll share all my new posts on my Facebook and Instagram every week. Launching a YouTube channel: I’ll come up with 5 video ideas to have before sharing my channel. I will have to share my channel through my Instagram once I have uploaded 1 video. Then I will consistently promote my videos using Instagram. Creating a photography portfolio: I will set up at least 1 grid of 9 photos before sharing my new Instagram handle. Then I will research on the 30 best hashtags to use for my niche. And I will reach more people by commenting on related photos, following other photographers, and sharing my portfolio account on my personal Instagram. Starting a small business: I will have 10 samples of my work available before I begin marketing my services. Then I’ll get my first orders by using word of mouth, sharing on my personal social media, and asking for referrals. Why are these goals worth your time? What could you get out of them? Also, consider other related goals or situations that might affect the ones you’re setting. If your passion project goals involve other people, stop and think about how your goals might affect them. Starting a blog: I know that if I start my lifestyle blog, I’ll be able to help other young women in need of fashion and beauty help. Eventually, I also hope the blog can become a way to earn through affiliate products, so I can fund my passion through my passion. Launching a YouTube channel: I’ve always wanted to be more natural on camera, and I’m already comfortable teaching crafts and DIY. By launching this YouTube channel, I can share everything I’ve learned over 10 years of creating DIY home decor, as well as learn more new things along the way. Creating a photography portfolio: If I start an Instagram portfolio, I’ll be able to book gigs with clients looking for freelance photographers. I can also reach more people this way because almost everybody’s on Instagram. Starting a small business: Starting a small customized watercolor print business from home would mean I’d have a way to earn from my painting hobby. I also plan on quitting my corporate job soon because my spouse and I are starting a family, so this small business can help me learn the ins and outs of marketing and sales – I can eventually start a full-blown business career to have more time at home with my spouse and future kids. And of course, your goals need to be time-bound! How long are you giving yourself to accomplish these goals? Again, don’t forget to be specific and realistic when setting these. Too far off, you won’t be motivated to get them done soon. Too soon, you might just overwhelm yourself. Pro-tip: Have both long-term and then short-term time-bound goals. Starting a blog: I will have 1,000 unique visitors after 2 months of consistent blogging, marketing, and promotions. Launching a YouTube channel: I will get 10 subscribers (that aren’t just my friends!) within 2 weeks of launching. Creating a photography portfolio: I will get my first client for photography services within 1 month. Starting a small business: I will get at least 10 customers within the first 3 months of launching my customized watercolor prints Etsy store. See? Setting SMART goals for your passion projects aren’t that hard – and I don’t know about you, but having those goals in place makes me really want to get to chase them! Goal: I want to launch a blog. Specific: I want to start a lifestyle blog to become a resource for young 20-something women in need of make-up advice, skincare reviews, and fashion tips. Measurable: I’ll set up and launch my blog and website in 2 weeks, and I will publish 1 new post once a week. Achievable: I will brainstorm on at least 15 possible topics to add to my editorial calendar before sharing my blog. Then, I’ll share all my new posts on my Facebook and Instagram every week. Relevant: I know that if I start my lifestyle blog, I’ll be able to help other young women in need of fashion and beauty help. Eventually, I also hope the blog can become a way to earn through affiliate products, so I can fund my passion through my passion. Time-Bound: I will have 1,000 unique visitors after 2 months of consistent blogging, marketing, and promotions. Okay, so you might have already guessed: setting SMART goals for your passion project is only the beginning. It’s one thing to have all your goals laid out in front of you, but the real progress happens when you actually show up and do the work. Your goals are your guiding lights, but it’s time to pack up your bags and start the trek towards slaying them one by one. It definitely can seem overwhelming, but don’t underestimate the power of doing the work. Ready to set S.M.A.R.T. Goals to help you achieve your goals? 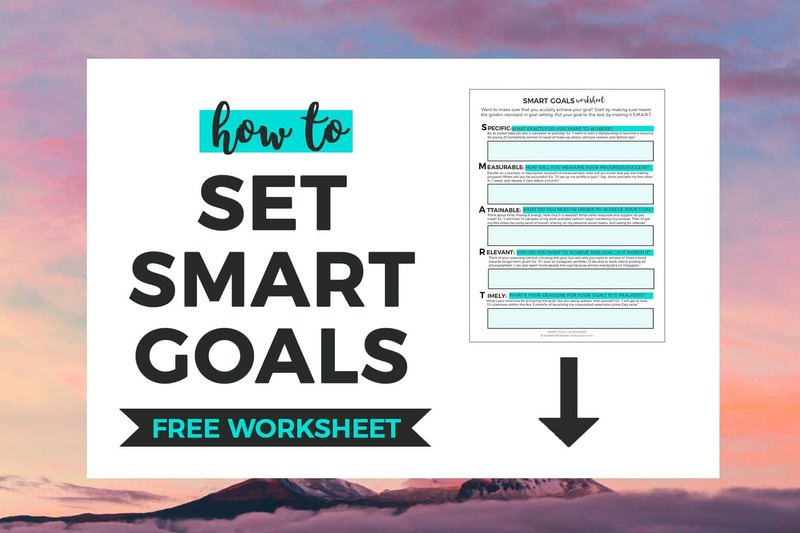 Start planning with passion project by making it Specific, Measurable, Achievable, Relevant and Time-Bound with the FREE SMART Goals Worksheet. Don’t forget: set those goals for those passion projects – and keep them SMART! – then do the work, work, work. Pretty soon, you’ll be slaying any and every goal you have, passion project or no passion project. 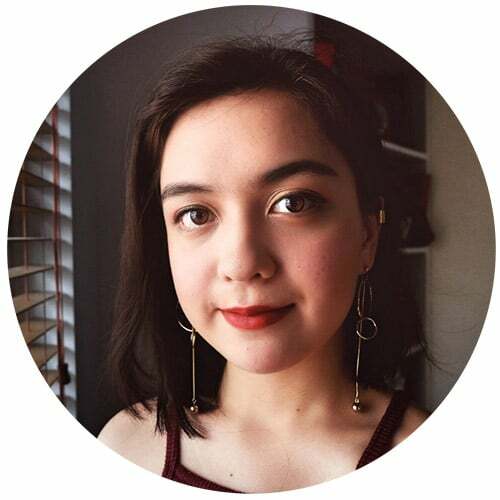 Mica of Mind of Mica helps multi-passionate millennials jumpstart meaningful and profitable side hustles and businesses. 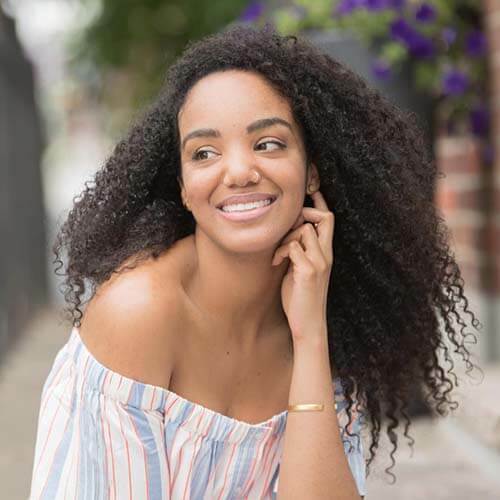 An incurable figure-outer, she’s found purpose in starting different passion projects-turned-side hustles and is now helping other people design their own profitable passion-based brand so they can live their lives the way they want. Very inspiring. And you mention a very good word in pursuit of your goals – relentless. Something that I am lacking, sad to say. Thanks for sharing this. 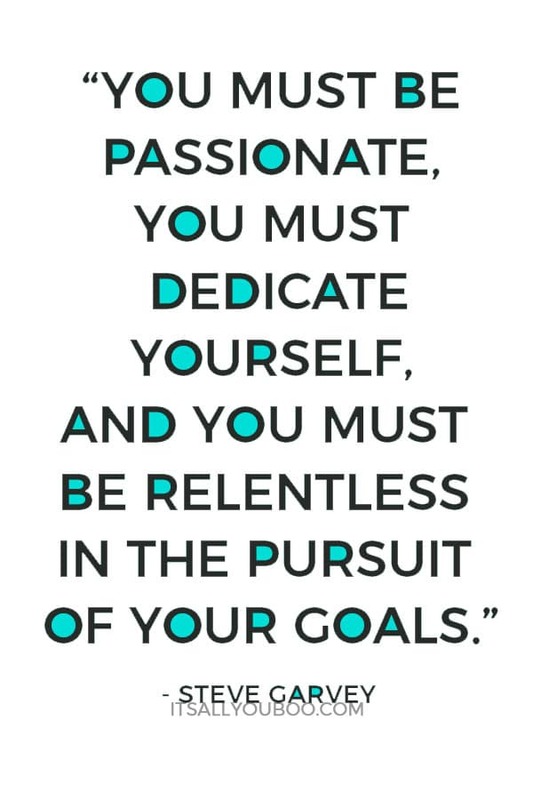 Yes, definitely we need to be relentless in the pursuit of our goals! I’m sure you’ll get the hang of it soon, as it’s really something you get better at (as with anything). I’m glad you enjoyed the post! Rooting for you always. You must have worked really hard on this blog post because WOW it is so full of amazing information and examples. I remember using this SMART tool in college, and I use it at work for projects as well! I’m glad you enjoyed the post. It’s definitely handy to have a reference for when you don’t know how and where to start on smart goal setting. Wow. Honestly I needed to see this. I’ve been feeling a bit uninspired and washed up but this seriously reignited something inside of me and I’m ready to hustle. Thank you! That’s so awesome! One way to let the inspiration stick is to keep looking back at those goals, so that you can keep reminding yourself about why you’re doing what you’re doing. Very inspiring, actually! I’m the worst at setting goals because I treat them like New Year’s resolutions, which means they won’t last two weeks! HA! I need to be more intentional about setting goals — small ones to start with — so I can feel more accomplished! We’ve all done it — the “not being serious about our goals” thing. But it’s cool that you’re now one of the few people who’re making the jump to being more intentional about your goal! And definitely agree with that starting small thing. You can increase your momentum as you go, and you’ll be slaying goal after goal in no time! Hey Sachi! I’m glad to hear this post was helpful for you! Do let me know how your goal setting and slaying turns out, okay? Yep they definitely are, aren’t they? Plus you can use it with literally any kind of goal in mind! I bet when you set those goals and show up to do the work, SMART goal setting will totally work for you! What a great post! I love working with clear outlined goals. It makes me work harder and smarter. Definitely agree! I always like to say that we never know if we’re headed the right way unless we know where we’re headed. So I think setting SMART goals is always the best first step! For a workaholic like myself this would be a great approach! I need this worksheet in my life! I suspect I’m starting to burn out! Yep, setting goals can definitely help you pace yourself to keep from burn out. I’m glad you enjoyed and I wish you all the best with your goals! Making goals is so very important no matter what it is in life. It makes me feel so much more accomplished when I have som set! I totally agree! We get so much more done when we know what it is we actually want to do. What an intricate and helpful system for goal setting. I struggle the most with setting time goals for sure. Have you never heard of SMART goals before? I love that it’s something new for you. Hope you find it helpful! So cool that this was interesting for you! I agree with Nadalie, I really hope you find this useful! I totally believe in the power of SMART goals, so we’re just sharing the love. Goals are such an important part of my life & SMART layout is the best way! Glad you’re a fan of SMART goals! Hope you enjoy the free worksheet too. SMART goal setting is definitely really handy!! I agree that I find it to be one of the best ways to set and slay my goals, so I’m so glad you’re one of those unapologetic goal-slayers! You’ve covered everything that I was expecting to be stated under goal setting. Very clear and descriptive points. I do agree with your Shlipa! Mica did a fantastic job in helping us get started with SMART goal setting. Aww, thanks so much! I’m really glad you enjoyed the post. Hope you get some inspiration for your own passion project goals! I need it to read this article because I definitely have troubles with my goals. I do have too many and they set me for failure. Yay for finding the perfect blog post for your struggle. Be sure to check out the goal setting worksheet too! So happy you found this article then! You should definitely make use of all the cool resources on here – you’ll be slaying goal after goal in no time. I used SMART Goals a lot when I was working fulltime out of my home. Sometimes I still apply the principles to my Blog. I cant say I always follow through but I try. I so agree with you SMART goal setting is so helpful for entrepreneurs and bloggers. Helps us figure out all the details ahead of time. So cool that you did some SMART goal setting!! I definitely think they would have helped. And it’s all right if we sometimes can’t stick to a goal for a little while, but as long as we keep fighting and showing up everyday to do the work, then we’d have nothing to worry about! I have a hard time meeting all of my goals without a planner. Though I found it has to be the right planner, they are not all the same. I really need to get back on track, this year has been hard to stick to it. I am such a planner lover, which probably why I created the Slay Your Goals Planner. It has the basics of SMART goal woven throughout. You’re so right, honestly, most planners on the market are only for time management, NOT goal setting. I struggle with the first point- making specific goals. I make mine way too general and then it is difficult to continue with the rest of the list. I have tried to make more specific goals here lately, even if they are just small ones, and it does help. You’re so not alone! It’s one of the biggest goals challenges our readers have – setting specific and meaningful enough goals. You need to get clear on what you want. Spend some time in quiet reflection, ask yourself the tough questions and don’t be afraid of the answer. THEN, set a goal that helps you make that a reality. YAS, I’m all about some SMART goals. I remember 1st hearing and learning about the concept when I first started working in Corporate America years ago. Now as a stay at home work at home Mom they are still very relevant in accomplishing any goal. Great share! You’re so right, it is one of those tried and true concepts that we all get through, but how often do we apply it to our personal goals. Very helpful for flushing out the exact details. I’m convinced that if your goals are SMART, it’s also a plan for how to achieve it. Wow! I’m big on planning and lists but this is an entirely new level of planning. I’m gong to have to re-read this a few times and then implement the strategy. Great post! Haha, it is! SMART goals are such a great way of making sure your goals are planned properly. My Slay Your Goals Planner actually has each of these aspects built into how you plan your goals. Give SMART Goals a try and let us know how it goes! I love setting short term goals to help me reach my long term goals. One day at a time knocking things out helps me from getting overwhelmed. Great quotes and tips too! So glad you enjoyed our SMART goals post. You’re so right, one step at a time we get there, and BONUS without being overwhelmed.